I will now show you a recipe for making omurice in only three minutes. No need for frying pans; this recipe only requires a microwave. 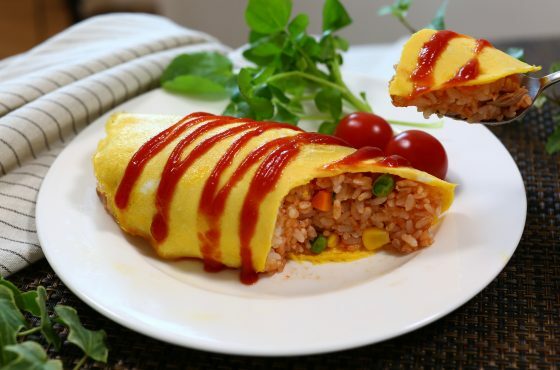 By the way, omurice is a western-style dish that is popular in Japan. 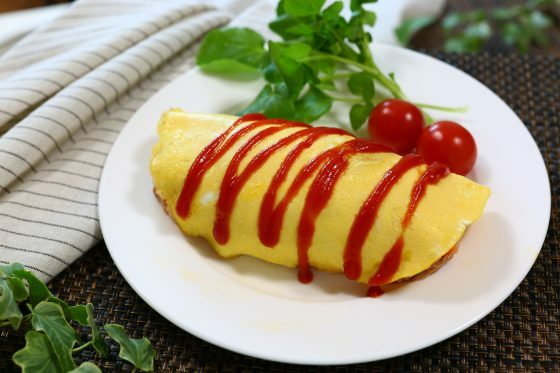 It consists of rice seasoned with ketchup, wrapped with egg like an omelet. 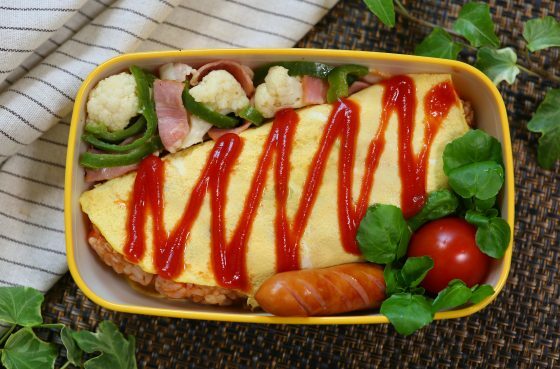 This is a “omurice” recipe. 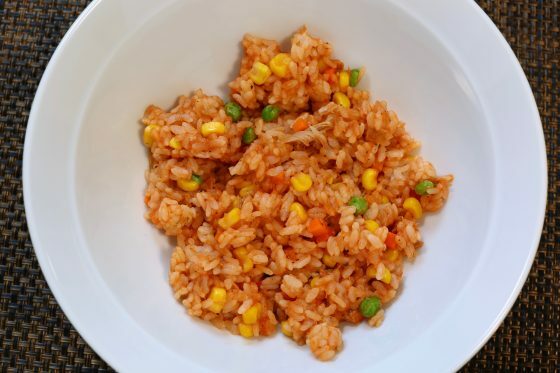 * Please see here for how to cook Japanese rice. Add the ingredients for the ketchup rice into a heat-resistant bowl, and mix thoroughly. Cover with Plastic wrap and cook in the microwave for one minute (500w). Add the ingredients for the fluffy egg into a bowl, and mix thoroughly. Line a flat plate with Plastic wrap, and pour the contents of step 2 onto it. Cook the mixture in the microwave for 1 minute and 10 seconds (500w), without covering it with Plastic wrap. Peel off the egg from the Plastic wrap. Place the contents of step 1 onto plate, place the egg from step 3 on top, and add ketchup to suit your taste. Your omurice is now ready. First, make the ketchup rice. Add the rice, mixed vegetables, tuna, salt, pepper, and ketchup into a heat-resistant bowl, and mix thoroughly. Cover with Plastic wrap, and cook for one minute on the microwave at 500w. Line a plate with Plastic wrap, and pour onto it the mixture of eggs and mayonnaise. Cook in the microwave (500w) for 1 minute and 10 seconds, without covering the mixture with Plastic wrap. If you cook the mixture in the microwave as described in the recipe, the egg should come out soft and fluffy. The cooking time for the egg will vary slightly depending on the size of the eggs. Feel free to adjust the time so that it comes out as soft or hard as you like. Serve the ketchup rice onto a plate, lay the egg on top, and add some ketchup over it. 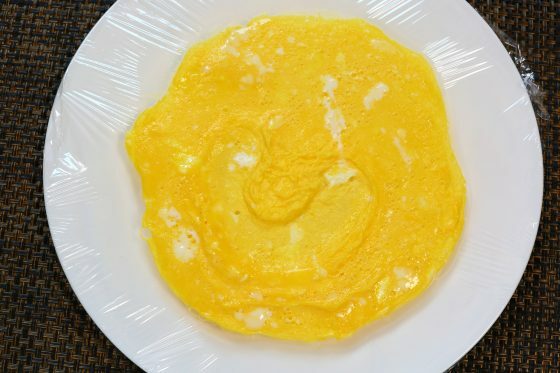 If you want to arrange the omurice into a nice shape, as shown in the above photo: Peel the Plastic wrap off the egg cooked in step 3, then place the egg on top of the Plastic wrap once again. Place the ketchup rice on top of the egg, and then wrap the whole thing using the Plastic wrap, to arrange it into a neat shape. The egg is fluffy, and the ketchup rice contains plenty of delicious ingredients. Preparation time is only three minutes. This recipe is really handy for when you are very busy. I also recommend it for lunch boxes.